Be the very best version of yourself wearing this glamorous designed Terani 1912E9180 evening dress. It will praise your sophisticated beauty by its flawless tailoring, the quality of its fabric, and the skills behind its design. This lovely evening dress is one of the best sellers on this Terani collection, for the design makes it possible for you to wear at the different sets of occasion, from the formal one to the friendly situations. This gorgeous evening dress is a special offer for ladies with modest and simple taste in fashion, for the delicate tailoring of the dress shapes a lovely silhouette based on a shiny caressing fabric, enjoying some embraced style on the bodice, trying to make your beauty doubled. The evening Terani dress, you are looking at features one sleeve open cut neckline bodice designed with great viewing your upper body specially the bust portion, continuing to the open back of the dress having revealing cutout. The bodice elaborating on the physical perfection fully showing of your shiny soft skin, going to the snugged waistline designed, embracing the hips, highlighting the delightful curves, and edges, enjoying an exaggerated attached to the long plunging cascading skirt with glamorous colorful hem. 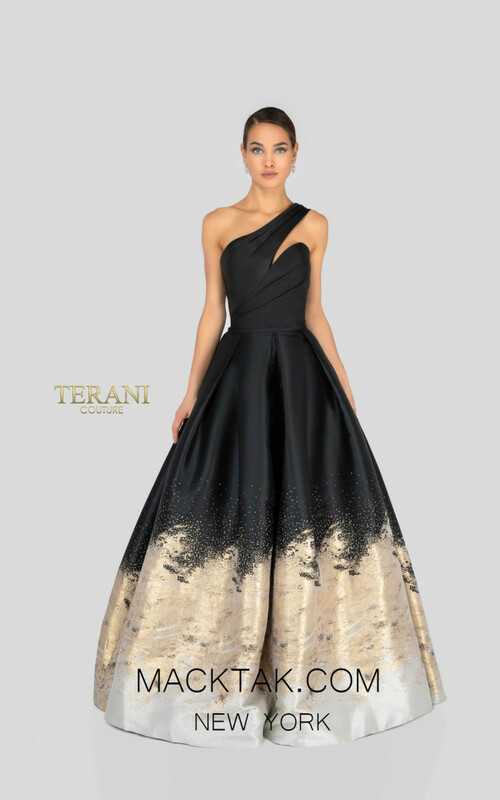 This Terani evening dress offers a desirable look the beautiful ladies to celebrate their God-given beauty in the most artistic, and wanted way. This special offer of Terani imposes a memorable look on your gorgeous body style, become one of the favorites from your closet. Terani Couture 2018 collection is one of the most surprising ones which is filled with extraordinary lavish, hear melting, and eye-catching designs, not to mention the quality of caressing fabrics in tones of models, colors, and styles, and they are really going to make you feel like an angel for all of your special golden occasions. You could simply choose the very own silhoutte of yours in a blink of an eye, and make the other guests envy your alluring look. Feel the beauty and modest in this lovely MackTak Evening Dress. The majestic design will mesmerize you!